Hitting the jackpot is literally the dream. It’s the reason we all play. The idea of stepping up to a slot machine, dropping in a few quarters, and walking away with thousands in winnings is enough to amp up even the coolest of cucumbers. Sometimes, winning the big prize is just that simple. Casual players just stroll up to a machine and pull the lever before transforming into celebration mode. Sometimes, though, winning the jackpot comes with one heck of a cool story. These weird, wacky jackpot winning stories were enough to pique our interest, and we’re betting you’ll be pretty impressed by them as well. Let’s take a look at what are most certainly the juiciest, most bizarre jackpot stories you’ll find anywhere on the web. Picture this: you walk into a gas station to buy a few scratch cards. Most of the cards leave you wanting, but one displays those magical symbols needed to payout some cash. This very situation happened to a young man in California, as it does to hundreds of others each and every day. Where this situation gets a bit more interesting though, is what happened next. The man handed the scratch card to the attendant in order to claim his money. Apparently he didn’t bother checking the prize for himself, because when the attendant handed him $75 he took the cash and was on his way. A few minutes later, the attendant realized he had made a mistake. The man’s winnings weren’t $75, as were paid out. They were actually $75,000! Unfortunately for the man with the winning ticket, the attendant didn’t discover the error until it was too late. Since then, the gas station manager has contacted lottery officials in an attempt to reconnect with the lucky patron, but he hasn’t had any luck. He even went so far as to release the security footage of the man to media in an effort to catch the winner’s attention and get him back into the store. By now, the man’s winnings have fallen victim to the statute of limitations, meaning that he effectively declined that $75,000 payout. The moral of the story has to be to check your winnings before you leave the store. Don’t depend on someone else to figure it out, or you could miss out on some serious dough. By now, you may have heard the story of Ashley Revell, the gutsy Brit who bet his life’s savings on a single spin of the roulette wheel. If you haven’t, let’s take this opportunity to get up to speed. In 2004, Revell was inspired by his friends to sell everything he owned and go on a life changing adventure. He said goodbye to his Rolex watch, BMW, golf clubs and other possessions and set about to double his money in one fell swoop. Ignoring the protests of his parents, Revell caught a flight to Las Vegas with a film crew and a rented tuxedo for his big night. In total, Revell’s worldly possessions netted him £76,480 worth of chips, but he wasted no time deciding where to put them. After putting the entire stack on red, we’re confident that the world stood still inside of that casino. Through luck, fate or divine intervention, Revell’s hard work paid off. The ball came to a stop on number seven, red. After walking away with £156,680 in winnings and buying back his things, he started an online poker company and set about on a more predictable life. He also invested in a trip around Europe on a motorbike, which is where he met his wife. You might just say that he hit the jackpot more than once thanks to that spontaneous wager. 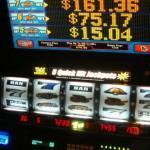 Winning a single progressive jackpot at a slot machine is no easy task. Seriously. The odds of landing the perfect combination amount to about one in 50 million. With that in mind, it would be easy to think that a single win would be enough to tide over a player for a lifetime. Think again! Elmer Sherwin, a 93-year-old slot aficionado, established himself as Las Vegas’s luckiest resident in 2005 when he hit the Megabucks jackpot for the second time. In case you’re wondering, the odds of hitting the jackpot twice in one lifetime come in somewhere around one in 25 quadrillion. Just to highlight the length of those odds, 25 quadrillion is a number featuring 15 zeros! Sherwin is a self-proclaimed regular at the Cannery Casino in North Las Vegas, where he frequents one machine in particular, IGT’s Megabucks Slot. Way back in 1989, he landed his first jackpot win on the machine to the tune of $5 million, but he didn’t use the money to retire from the casino game. Instead, he set his sights on doing the unthinkable: winning two jackpots. It took well over a decade, but his persistence paid off in 2005 with an amazing $21 million jackpot win. If you think he’s satisfied with having the title of the only two-time winner though, think again. Sherwin is now trying to claim his third progressive jackpot. The odds are incredibly long, but do you really want to bet against him? Whether you win through incredible means or just unsuspectingly claim the big prize, there’s nothing that compares to the feeling of landing a progressive jackpot. These days, the odds of winning are better than ever, because you no longer need to visit the casino in order to spin the reels. 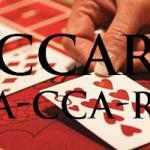 Prism Casino is your online destination for top quality games and huge progressive jackpots. If you’re able to win, be sure to take a picture and publish your story. People just love to read about the events leading up to a jackpot win!